The advance Party arrived at Takhli RTAFB via C-130on 4 October 1966 after one LONG flight. The main body arrived via 3 increments via C-141, the first increment landed at Takhli RTAFB on 13 October 1966 and the third increment landed on 15 October 1966. I was in the first of the C-141's as myself and a few others in the Signal Detachment had to establish the SFOB Base station at Camp Pawai. Our heavier equipment, vehicles, AN/TSC-26, etc arrived in December 1966 at the port of Sattahip. Accompanying the equipment was the Electronic Maintenance and the Quartermaster Warrant Officers. This proved to be good planning, as the ship got stuck in a line on the Saigon River and when it was time for the ship to off-load equipment for US Forces in SVN, the #@&* legs at the Port of Saigon tried to take the entire cargo. Thanks to two armed folks, a manifest, and the property books, the legs finally let the ship proceed to Sattahip. In the original company roster my name was mistakenly printed SSG James D. Peters, vice SSG James K. Peters, but my orders and other entries in the 1966-1967 yearbook have my name spelled correctly. 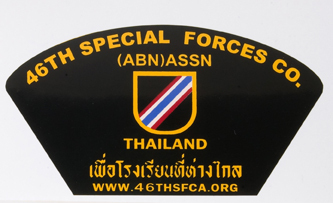 Co D, 1st SGGA was deactivated on 10 April 1967 and the 46th SFCA was activated.